Federation Square is a venue for arts, culture and public events on the edge of the Melbourne central business district. It covers an area of 3.2 ha (7.9 acres) at the intersection of Flinders and Swanston Streets built above busy railway lines and across the road from Flinders Street station. It incorporates major cultural institutions such as the Ian Potter Centre and ACMI and Koorie Heritage Trust as well as cafes and bars in a series of buildings centred around a large paved square, and a glass walled atrium. The corner is occupied by a glass walled pavilion that provides access to the underground Melbourne Visitor Centre. it is the center of melbourne and most visited place in melbourne. most of the cultural and festive programmes are held there. specially christmas. Melbourne's central city grid was designed without a central public square, long seen as a missing element. From the 1920s there were proposals to roof the railway yards on the southeast corner of Flinders and Swanston Streets for a public square, with more detailed proposals prepared in the 1950s and 1960s. In the 1960s, the Melbourne City Council decided that the best place for the City Square was the corner of Swanston and Collins Streets, opposite the town hall. The first temporary square opened in 1968, and a permanent version opened in 1981. It was however not considered a great success, and was redeveloped in the 1990s as a smaller simpler space in front of a new large hotel. Meanwhile, the railway yards had been partly roofed by the construction of the Princes Gate Towers, known as the Gas & Fuel Buildings after their major tenant, the Gas and Fuel Corporation over the old Princes Bridge station, in the 1960s. This included a plaza on the corner, which was elevated above the street and little used. Between that and Batman Avenue, which ran along the north bank of the Yarra River, were the extensive Jolimont Railway Yards, and the through train lines running into Flinders Street station under Swanston Street. In 1996 the then Premier Jeff Kennett announced the much-hated Gas & Fuel Buildings would be demolished, and the railyards roofed and a complex including arts facilities and a large public space would be built. It was to be named Federation Square, and opened in time to celebrate the centenary of Australia's Federation in 2001, and would include performing arts facilities, a gallery, a cinemedia centre, the public space, a glazed wintergarden, and ancillary cafe and retail spaces. An architectural design competition was announced that received 177 entries from around the world. Five designs were shortlisted, which included entries from high-profile Melbourne architects Denton Corker Marshall and Ashton Raggatt McDougall, and lesser known Sydney architect Chris Elliott, and London based Jenny Lowe/Adrian Hawker. The winner announced in July 1997, was a consortium of Lab Architecture Studio directed by Donald Bates and Peter Davidson from London, Karres en Brands Landscape Architects directed by Sylvia Karres and Bart Brands, who joined with local architects Bates Smart for the second stage. The design, originally costed at between $110 and $128 million, was complex and irregular, with gently angled 'cranked' geometries predominating in both the planning and the facade treatment of the various buildings and the wintergardens that surrounded and defined the open spaces. A series of 'shards' provided vertical accents, while interconnected laneways and stairways and the wintergarden would connect Flinders Street to the Yarra River. The open square was arranged as a gently sloping amphitheatre, focussed on a large viewing screen for public events, with a secondary sloped plaza area on the main corner. The design was widely supported by the design community but was less popular with the public. The design was also soon criticized when it was realised that the western freestanding 'shard' would block views of the south front of St Paul's Cathedral from Princes Bridge. The mix of occupants and tenants were soon modified, with the cinemedia centre becoming the new body known as ACMI, as well as including offices for multicultural broadcaster SBS and the gallery space becoming the Australian art wing of the National Gallery of Victoria, the performance arts space was dropped, and the number of commercial tenancies increased, with a new substantially rearranged design revealed in late 1998. After the 1999 State election, while construction was well underway, the incoming Bracks Government ordered a report by the University of Melbourne's Professor Evan Walker into the western shard, which concluded in February 2000 that the "heritage vista" towards St Paul's cathedral should be preserved, and the shard be no more than 8m in height. Budgets on the project blew out significantly due to the initial cost being seriously under estimated, given the expense of covering the railyards, changes to the brief, the need to resolve construction methods for the angular design, and the long delays. Among measures taken to cut costs was concreting areas originally designed for paving. The final cost of construction was approximately $467 million (over four times the original estimate), the main funding primarily from the state government, with $64 million from the City of Melbourne, some from the federal government, while private operators and sponsors paid for fitouts or naming rights. The square was opened on 26 October 2002. Unlike many Australian landmarks, it was not opened by the reigning monarch, Elizabeth II, nor was she invited to its unveiling; she visited Federation Square in October 2011. In 2006, Federation Wharf redeveloped the vaults under Princes Walk (a former roadway) into a large bar, with extensive outdoor areas on the Yarra riverbank, with elevator access to Federation Square. Several proposals have been prepared for the area known as Federation Square East, the remaining area of railyards to the east. There have been proposals for office towers and, more recently, a combination of open space and a hotel, or another campus for the National Gallery of Victoria to house their contemporary art collection. In December 2017, the Andrews government announced that one of the buildings of the square, the Yarra Building, would be demolished to make way for a freestanding Apple Store, generating strong criticism over the commercial use of a cultural space. Apple cancelled plans in April 2019 after the application to demolish the Yarra Building was denied. Federation Square occupies roughly a whole urban block bounded by Swanston, Flinders, and Russell Streets and the Yarra River. The open public square is directly opposite Flinders Street station and St Paul's Cathedral. The layout of the precinct is designed to connect the historical central district of the city with the Yarra River and a new park Birrarung Marr. The complex of buildings forms a rough U-shape around the main open-air square, oriented to the west. The eastern end of the square is formed by the glazed walls of The Atrium. While bluestone is used for the majority of the paving in the Atrium and St Paul's Court, matching footpaths elsewhere in central Melbourne, the main square is paved in 470,000 ochre-coloured sandstone blocks from Western Australia and invokes images of the outback. The paving is designed as a huge urban artwork, called Nearamnew, by Paul Carter and gently rises above street level, containing a number of textual pieces inlaid in its undulating surface. There are a small number of landscaped sections in the square and plaza which are planted with Eucalyptus trees. The large screen is used for public events. Pictured is a telecast of Kevin Rudd's parliamentary apology to the stolen generations. A key part of the plaza design is its large and fixed public screen, which has been used to broadcast major sporting events such as the AFL Grand Final and still[when?] continues to do so. During the 2006 FIFA World Cup, thousands of football fans assembled to watch. The architecture of the square is in the deconstructivist style, with both plan and elevations designed around slightly angular, 'cranked' geometries, rather than tradition orthogonal grids. The built forms are mainly slightly bent north-south volumes, separated by glazed gaps, a reference to traditional Melbourne laneways, with vertical 'shards', attached or freestanding, containing discrete functions like the Visitor's Centre, or lifts and stairs. The larger built volumes are relatively simple reinforced concrete buildings with glass walls, but with a second outer skin of cladding carried on heavy steel framing, folded and stepped slightly to create angular undulating surfaces. The cladding is composed of 6 different materials, zinc, perforated zinc, glass, frosted glass, sandstone and no cladding, in a camouflage-like pattern, and created using pinwheel tiling. The 'crossbar' is an east-west built from that runs through the long gallery building, and is clad in perforated black steel panels. St Paul's Cathedral and the eastern shard. Three shards frame the square space. The eastern and southern shards are completely clad in metallic surfaces with angular slots, very similar in design to the Jewish Museum Berlin, while the western shard is clad in glass. Adjoined to the southern shard is a hotel which features the wrap around metallic screen and glass louvers. There are a number of unnamed laneways in the Federation Square complex which connect it to both Flinders Street and the Yarra River via stairways. The stairways between the Western Shard and nearby buildings are also paved in larger flat rectangle sandstone blocks. The riverfront areas extend south to an elevated pedestrian promenade which was once part of Batman Avenue and is lined with tall established trees of both deciduous exotic species and Australian eucalpyts. More recently, the vaults adjacent to the Princes Bridge have been converted into Federation Wharf, a series of cafes and boat berths. Some of the areas between the stairs and lanes leading to the river are landscaped with shady tree ferns. Glass walls of the atrium space. The "atrium" is one of the major public spaces in the precinct. It is a laneway-like space, five stories high with glazed walls and roof. The exposed metal structure and glazing patterns follow the pinwheel tiling pattern used elsewhere in the precinct's building facades. The "labyrinth" is a passive cooling system sandwiched above the railway lines and below the middle of the square. The concrete structure consists of 1.2 km of interlocking, honeycombed walls. It covers 1600 m2. The walls have a corrugated profile to maximize their surface area, and are spaced 60 cm apart. During summer nights, cold air is pumped in the combed space, cooling down the concrete, while heat absorbed during the day is pumped out. The following day, cold air is pumped from the labyrinth out into the atrium through floor vents. This process can keep the atrium up to 12 °C cooler than outside. This is comparable to conventional air conditioning, but using one-tenth the energy and producing one-tenth the carbon dioxide. During winter, the process is reversed, storing warm daytime air in the Labyrinth overnight, and pumping it back into the atrium during the day. The system can also partly cool the ACMI building when the power is not required by the atrium. Flinders Street station and the stunted glass Eastern Shard, entry to the Melbourne Visitor Centre. The Melbourne Visitor Centre is located underground, with its entrance at the main corner shard directly opposite Flinders Street Station and St Pauls Cathedral and its exit at the opposite shard. The entrance and exit shards feature interactive news tickers in colour LEDs and small screens promoting current activities. The Visitor Centre was intended to replace a facility which was previously located at the turn of the 19th-century town hall administration buildings on Swanston Street. The Edge theatre is a 450-seat space designed to have views of the Yarra River and across to the spire of The Arts Centre. The theatre is lined in wood veneer in similar geometrical patterns to other interiors in the complex. The Edge was named "The BMW Edge" until May 2013, when a new sponsorship deal with Deakin University caused it to be renamed "The Deakin Edge". Zinc is a function space underneath the gallery building, and opens onto the Yarra river bank. It was intended as an entirely commercial part of the development of Federation Square, and is used for wedding receptions, corporate events, launches, and the like. The Ian Potter Centre houses the Australian part of the art collection of the National Gallery of Victoria (NGV), and is located at Federation Square (international works are displayed at the NGV International on St Kilda Rd). There are over 20,000 Australian artworks, including paintings, sculpture, photography, fashion and textiles, and the collection is the oldest and most well known in the country. Well-known works at the Ian Potter Centre include Frederick McCubbin's Pioneers (1904) and Tom Roberts' Shearing the Rams (1890). Also featured are works from Sidney Nolan, John Perceval, Margaret Preston and Fred Williams. Indigenous art includes works by William Barak and Emily Kngwarreye. The National Gallery at Federation Square also features the NGV Kids Corner, which is an interactive education section aimed at small children and families, and the NGV Studio. Australian Centre for the Moving Image. The Australian Centre for the Moving Image has two cinemas that are equipped to play every film, video and digital video format, with attention to high-quality acoustics. The screen gallery, built along the entire length of what was previously a train station platform, is a subterranean gallery for experimentation with the moving image. Video art, installations, interactives, sound art and net art are all regularly exhibited in this space. Additional venues within ACMI allow computer-based public education, and other interactive presentations. In 2003, ACMI commissioned SelectParks to produce an interactive game-based, site-specific installation called AcmiPark, which replicates and abstracts the real-world architecture of Federation Square. It also houses highly innovative mechanisms for interactive, multi-player sound and musical composition. Transport hotel and bar is a three-level hotel complex adjacent to the southern shard on the south western corner of the square. It has a ground-floor public bar, restaurant and cocktail lounge on the rooftop. The Melbourne television and radio offices of the Special Broadcasting Service (SBS), one of Australia's two publicly funded national broadcasters is in one of the office buildings along Flinders Street. The headquarters of Melbourne Festival (formerly Melbourne International Arts Festival) are located on Level 2 of the Yarra Building. Federation Square has recently become home to several beer award shows, and tastings, including the Australian International Beer Awards trade and public shows, as well as other similar events such as showcases of local and other Australian breweries. These events have been held in the square's indoor outdoor area the Atrium and usually require an entry fee in exchange for a set number of tastings. A tram on Flinders Street, with the East Shard and the ACMI building in the background. After its opening on 26 October 2002, Federation Square remained controversial among Melburnians due to its unpopular architecture, but also because of its successive cost blowouts and construction delays (as its name suggests, it was to have opened in time for the centenary of Australian Federation on 1 January 2001). The construction manager was Multiplex. The designers of Federation Square did not get any work for six months after the completion of the A$450 million public space, but did receive hate-mail from people who disliked the design. The Australian Financial Review later reported that some Melburnians have learned to love the building, citing the record number of people using and visiting it. In 2005 it was included on The Atlantic Cities' 2011 list of "10 Great Central Plazas and Squares". ^ "Federation Square, a place in history" (PDF). Fed Square Melbourne. Federation Square Management Pty Ltd. Retrieved 11 February 2018. ^ Fiona Whitlock (9 December 1996). "Demolitions days". The Age. Melbourne: 150.theage.com.au. Retrieved 16 March 2008. ^ "Federation Square: A Future About Shatters". Architecture Australia. Vol 86 (No 6). November 1997. Retrieved 11 February 2018. ^ "Federation Square, a place in history 2001" (PDF). Fed Square. Federation Square Management Pty Ltd. Retrieved 11 February 2018. ^ Gabriella Coslovich (26 April 2003). "The Square's vicious circle". The Age. Melbourne: www.theage.com.au. Retrieved 16 March 2008. ^ "City of Fun". The Herald Sun. 25 November 1998. ^ "GOVERNMENT ACCEPTS RECOMMENDATION TO SAVE ST PAUL'S VISTA". OFFICE OF THE PREMIER AND TREASURER: Media Release. www.legislation.vic.gov.au. 17 February 2000. Retrieved 16 March 2008. ^ a b c "FEDERATION SQUARE OPEN TO PUBLIC FROM OCTOBER 26". MINISTER FOR MAJOR PROJECTS Media Release. www.legislation.vic.gov.au. 18 October 2002. Retrieved 16 March 2008. ^ "Backlash over plan to demolish Federation Square building to make way for Apple shop". The AGE. Retrieved 20 December 2017. ^ Lucas, Clay (5 April 2019). "Apple store plans shelved after heritage authorities say 'no'". The Sydney Morning Herald. Retrieved 5 April 2019. ^ "Zinc at Fed Sq". ZincFedSq. Retrieved 26 July 2018. ^ "Melbourne's Federation Square among world's ugliest buildings". news.com.au. 23 November 2009. ^ Byrnes, Mark (28 October 2011). "The Best and Worst of the World's Central Plazas and Squares", The Atlantic Cites. Retrieved 14 August 2012. Brown-May, A. and Day, N. (2003). Federation Square, South Yarra, Vic: Hardie Grant Books (ISBN 1-74066-002-1). "Melbourne gets square". Sydney Morning Herald (Australia), 19 October 2002. 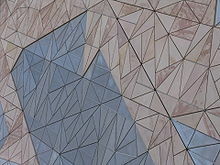 Wikimedia Commons has media related to Federation Square.